iÃ‚Â´d need some different noise colours as in the quantum rainbow.. is there anything like that as diy-kit? It's a matter of filtering the white noise, right? I do recall a module with white, pink, red, and blue noise, Buchla? not a kit though, just a PCB. 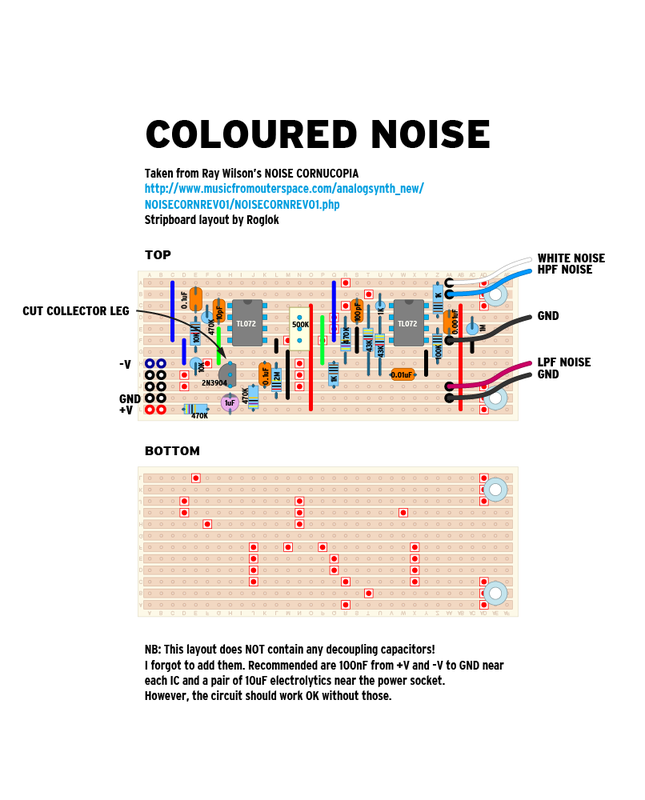 also: do you need scientifically accurate noise colors http://en.wikipedia.org/wiki/Colors_of_noise#Technical_definitions or just different sounding noise? thanks, but the link doesnÃ‚Â´t work. what is with buchla? yes.. looking for something like that .. white, pink, red..
itÃ‚Â´s important that the front panel hasnÃ‚Â´t too many hp respecively that there is a diy-kit (pcb+panel) existing. sorry, should have mentioned that. i think, itÃ‚Â´s different accurate noise colors than (when taking doepfers noise and quantum rainbow as reference?). the purpose is to avoid a filter after every noise source. I think infra red is like pink, but cooler (walks with a swagger). but probably that would be all iÃ‚Â´d need .. some different colours available on a small front panel. not really, but thank you for the offer! and the problem is, that i totally donÃ‚Â´t like self-drilled panels. i think you'll have trouble finding a full-fledged kit w/ panel and all for euro - but I just found Paia does one for Frac: http://www.paia.com/proddetail.asp?prod=9751K&cat=12 - maybe you can adapt? hmm, maybe schaeffer would really be an option. no idea about the costs. so if itÃ‚Â´s okay, iÃ‚Â´d like to have a look on the layout. Have you looked at hexinverter vc noise? It us on my want list. Comes in prebuilt and DIY both euro. yes, have already found the hexinverter one. very nice design! You've got to start somewhere Have a look for a simple single transistor solutions for white noise. Doepfer sell pre-drilled panels for ca. Ã¢â€šÂ¬5. For a noise module you wouldn't need more than a 4HP multiple sized panel. Otherwise, my tip is to buy PCB-material blanks from Makenoise or MFB - very easy to drill and the black looks great. yeah of course ... in case of only-noise .. it wouldnÃ‚Â´t be that bad with the missing front panel design. but perhaps sometimes something will be offered in the diy-section .. have to start to look more within the diy-section here! It's basically a random CV. I've build this on a breadboard using a transistor instead of the noise diode, and it worked pretty good. here's the promised stripboard layout - PDF for printing below. as stated in the image, i forgot to add decoupling caps (this was one of the first modules i ever built ). EDIT 01.12.2015 This layout is bugged. Please see further down this thread for a corrected version. You could even leave out the sample and Hold for a super simple noise circuit that provides, White, Pink and Slow Random signals. holy crap... nobody knows about elby on here? ED-115 is available as PCB, components, euro panel, full kit, and fully assembled. it's exactly what the OP is asking for isn't it? hey that thing looks great! i might just get a PCB myself... but $17 for shipping costs are quite steep. me too! was a very easy build from a full kit, no dramas. Though it's about a deep as it could possibly be and still fit in my monster base. This is worth mentioning, it is huge. Still, to me it doesn't really belong in a skiff so it no problem at all.